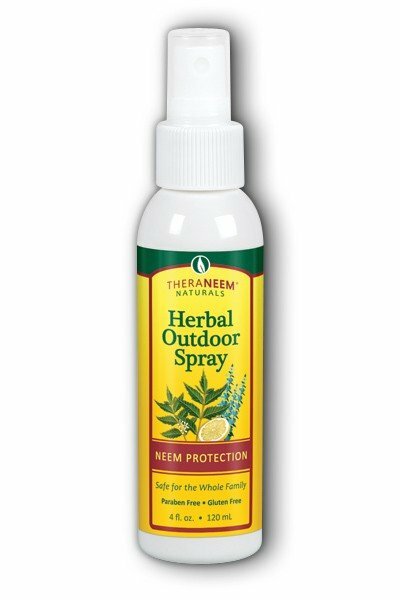 TheraNeem® Herbal Outdoor Spray is a superior natural product originally developed for use in the Florida Everglades. Soothing formula. TheraNeem® Spray is water-based, so it does not leave a sticky, oily residue. Safe for the whole family. Directions: Apply liberally. For external use only. Avoid contact with eyes. If irritation persists, consult your health care practitioner. Ingredients: Aqueous Extract of Azadirachta Indica (Neem) Leaf*, Aloe Barbadensis Gel*, Polysorbate 20, Oleth 10, Azadirachta Indica (Neem) Oil*, Juniperus Mexicana (Cedarwood) Oil, Eucalyptus Globulus Leaf Oil, Thymus Zygis (White Thyme) Oil, Citrus Cymbopogon Schoenanthus (Lemongrass) Oil, Cymbopogon Nardus (Citronella) Oil, Citrus Medica Limonum (Lemon) Peel Oil, Melaleuca Alternifolia (Tea Tree) Leaf Oil, Potassium Sorbate, Sodium Acrylate Crosspolymer, Citrus Aurantium Bergamia (Bergamot) Fruit Oil**, Lavandula Hybridia Oil.